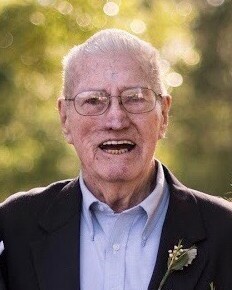 Donald F. Watson, 90, went home to the Lord on Monday, April 8, 2019 at his Yulee, FL residence while surrounded by his family. He was born April 30, 1928 in Philadelphia, PA and moved to Yulee in 2008 from Clifton Heights, PA.
Mr. Watson was a devout Catholic all his life and was a member of St. Francis Church in Yulee, FL. He was a retired sales representative for Frank W. Winnie Rope and Twine Co. of Philadelphia, PA. He was a Korean War Veteran serving with the U. S. Army. Above all, he was a family man and wonderful role model. He dearly loved his family and was a devoted husband to his late wife, Patricia, and a devoted father, grandfather and great grandfather. Mr. Watson was an avid follower of all Philadelphia sports teams and Notre Dame. Survivors include his 10 children, Patti Longo (Anthony) of Yulee, FL, Maggie Watson (Bruce Erickson) of Mendocino, CA, Theresa Lord (Tom) of Wilmington, DE, Donald F. Watson, Jr. (Peggy) of Fernandina Beach, FL, Anne Ford (Mark) of Yulee, FL, Marty Watson (Stacey) of Westchester, PA, Mazzy Brown (Bobby Cavanaugh) of Secane, PA, Lor Onorato (Mark) of Hockessing, DE, John Watson (Chris) of Brigantine, NJ, and Jimmy Watson of Yulee, FL. He is also survived by his 25 grandchildren Ricky Osgood, Erin Lord, Mike Ford, Ryan Watson, Tommy Lord, Don Watson III, Stephen Brown, Jason Lord, Mark Onorato, Danielle Stubits, Julian Erickson, Mathew Brown, Kelly Longo, Katie Lord, Timmy Brown, Joey Brown, David Watson, Melanie Watson, Lauren Lord, Stephan Onorato, Gabby Watson, Zachary Watson, Christopher Watson, Tyler Watson, Avery Watson ; and nine great grandchildren Brysin and Beckham Osgood, Joey, Lucy and Frankie Lord, Aiden Torbush, Noah Longo, Colin Watson and Cooper Stubits. There was a private family viewing. A Memorial Mass will be held at 2:00 P.M. Friday, May 10, at St. Francis Catholic Church in Yulee. The family thanks and suggests that memorial donations be made to Community Hospice and Palliative Care, 4266 Sunbeam Rd, Jacksonville, FL 32257.